"Taking four or more medications can increase seniors' fall risks." Though prescription and over-the-counter medications are meant to promote senior health, they often have unintended side effects. Digestive issues and dizziness are among the top concerns, and they can do more than just make your loved one uncomfortable. Vice President/Chief Nursing Officer of Edgewood Management Group Michael Johnson, RN, explained in an interview that taking four or more medications can increase seniors' risks for falls, as the various side effects can make balancing harder. That's why Edgewood has started the Medication Reduction Program. Through this initiative, staff review residents' medication lists alongside the seniors and their family members to determine if that number of drugs can be reduced. For example, some residents may be on two separate medications to control high blood pressure when they could really be better off with just one. With a resident's approval, staff can work with health care providers to better manage the number of medications he or she is taking. Ultimately, loss of balance is usually the culprit of senior falls. Certain physical movements may help seniors enhance their stability. Toe stand exercises may be an effective measure for this, according to the National Institutes of Health. To do this, hang on to something for support, like a railing, and stand with your feet shoulder-width apart and knees slightly bent. Stand on your tiptoes as high as you can go, and then bring your heels back to the ground. Repeat this about 10 times. No matter how excellent a senior's balance is, he or she can still trip over an object on the ground. 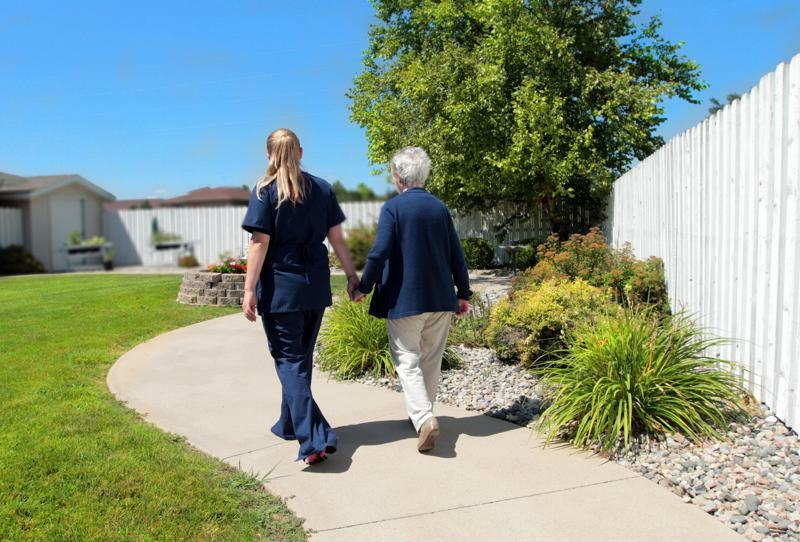 Though staff at Edgewood will keep floors decluttered at your loved one's senior living community, family members should make sure their own homes have clear walking paths when the senior visits. Beyond picking up the grandkids' toys and keeping small dogs out of the way, consider the safety of uneven surfaces. For good measure, make sure all rugs in your home have slip-resistant backing. Additionally, guide your loved one over steps, ramps and raised entryways. Walk on smooth, paved surfaces to reduce your senior loved one's risk for falling. According to the Mayo Clinic, one of the best ways to prevent falls is to stay physically active, particularly with exercises that target balance, flexibility and strength. Walking is a low-intensity workout that can be turned into a fun activity. Take your senior loved one for a stroll around your local park, or simply peruse the grounds at his or her senior living community. Edgewood offers a number of group classes that encourage physical activity, and participating provides an effective workout and an opportunity to make new friends. Proper vision is crucial for avoiding falls, as eyes can alert seniors of any potential hazards. Make sure your loved one schedules regular eye exams, perhaps as frequently as every six to 12 months, as suggested by the Glaucoma Research Foundation. Along those same lines, make sure all of the rooms in your home have adequate lighting.